I love it when my hands are busy. I think it has a calming effect on me. Yesterday the girls learned a new skill to keep their hands busy. 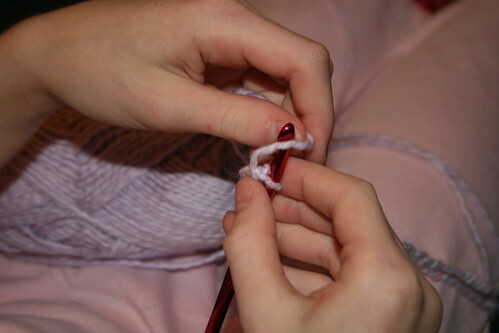 Crocheting. The girls learned at Activity Days. They both seem to enjoy it. I don't really know how to do it but I can fake it somewhat and help when mistakes are made. They were making all kinds of chains and bracelets last night and today. It's nice to see them walking around with a hook and yarn instead of a DS or iPod. And it's something quiet they can take along in the car. Mattey wants me to teach her to knit. I think she needs to experience crocheting for a little while longer before I introduce something new to keep her hands busy.